If you plan on a 4th of July picnic, barbecue, or get-together, this American Flag (Red, White and Blue) Cheesecake recipe is the perfect dessert. It's easy, tasty and if you use low-fat and sugar-free ingredients, it's much healthier. Oh, and the kids will love it! Rinse and dry strawberries. Slice 1 cup of the strawberries; set aside. Halve the remaining 3 cups strawberries; set aside. Stir boiling water into the dry gelatin mixes in large bowl for at least 2 min. until completely dissolved. Add enough ice to the cold water to measure 2 cups. Add to gelatin; stir until ice is completely melted. Refrigerate 5 min. or until gelatin is slightly thickened (consistency of unbeaten egg whites). Meanwhile, line bottom of a 13×9-inch dish with cake slices. Add sliced strawberries and 1 cup of the blueberries to thickened gelatin; stir gently. Spoon over cake slices. Refrigerate 4 hours or until set. Beat cream cheese and sugar in large bowl with electric mixer until well blended; gently stir in the whipped topping. Spread over gelatin. 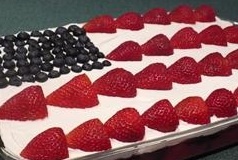 Arrange strawberry halves on cream cheese mixture to resemble the stripes of a flag. Arrange the remaining 1/3 cup blueberries on cream cheese mixture for the stars. Store any leftover dessert in refrigerator. I hope you enjoy… and have a safe and Happy Fourth of July! A friend gave me this recipe and she couldn't remember where she got it from.